You know things are looking up when you’ve only spent two minutes putting the little one down for his nap, when the little one slept EIGHTEEN HOURS–eighteen! !the day before–it was textbook perfect, but so odd for LL that I spent half the day being anxious about why he was sleeping as much as he should. Was he ill? 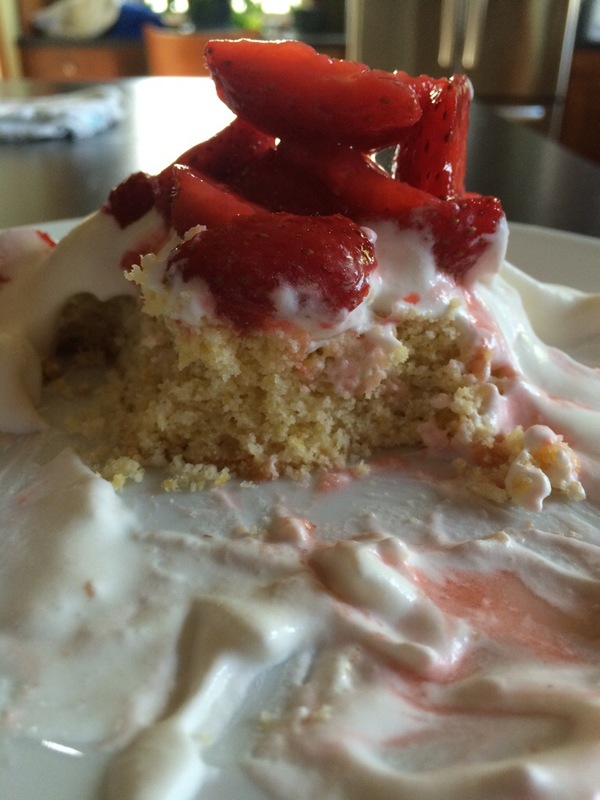 Depressed?–and when you have strawberry shortcake for breakfast. During the first day of LL back on the “ohmyGAWD-my-child-sleeps-schedule! !” I was supposed to be mowing the lawn. Mind you, we have a push mower, a lawn with craters like the moon and I am more out of shape than I ever have been. It took me three nap cycles and from 11 a.m. to 9 p.m. to finish 3/4 of the lawn. So when I spied several ruby strawberries in our patch at 8:45 p.m., I eagerly took a break. And HOT DAMN! The fistful of starts I had planted three years ago were loaded with fruit. Every year I have cursed the runners the plants put out as they attempt to take over the whole bed. I wouldn’t mind, but the berries have never been that fantastic. Until this year. I quickly swapped the mower for the berry boxes I’d saved and began picking in earnest. Every clump of leaves I pulled apart revealed more tear-drop jewels, and for every two I picked, I plopped one in my mouth. 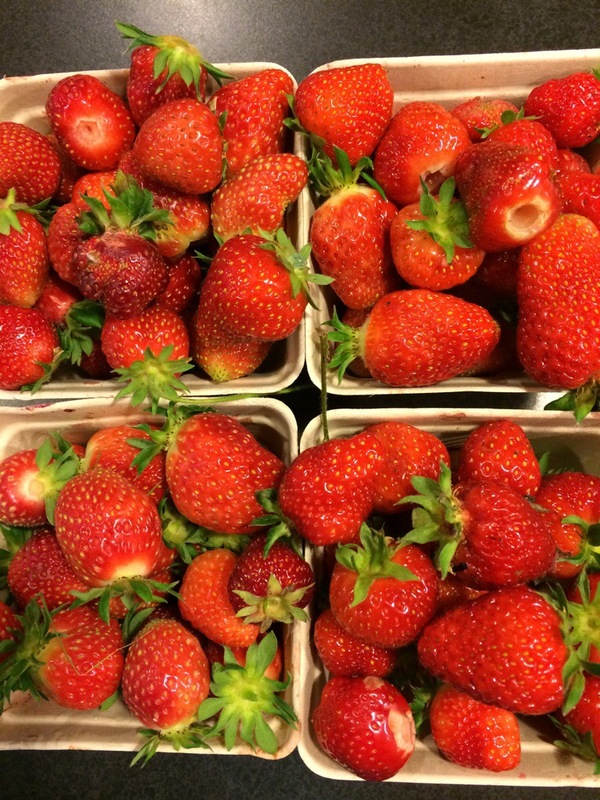 They are quite possibly the best strawberries I’ve ever tasted. This, from a California girl who used to eat entire flats and break out in hives. I know my strawberries. And they are overtaking my bed! I could not be happier. And so I made the first part of these one night and resumed the baking when my personal Pink Dot had arrived last night with the cream. I kept trying to tell him it was a miracle of miracles, perhaps never to be replicated again, but just then, the four of us hovering over wine and pasta and fried zucchini salad, and N whipping the cream at full force without fear of waking the deep-sleeping LL, and all of us going back for more whipped cream–I tell you, not only did I feel a smidge of my old self just then, but joyful for my new one. For the amazing family and friends in front of me, for the time and energy to do something I love–cook–and for the obscenely adorable monkey asleep in the nearby room. 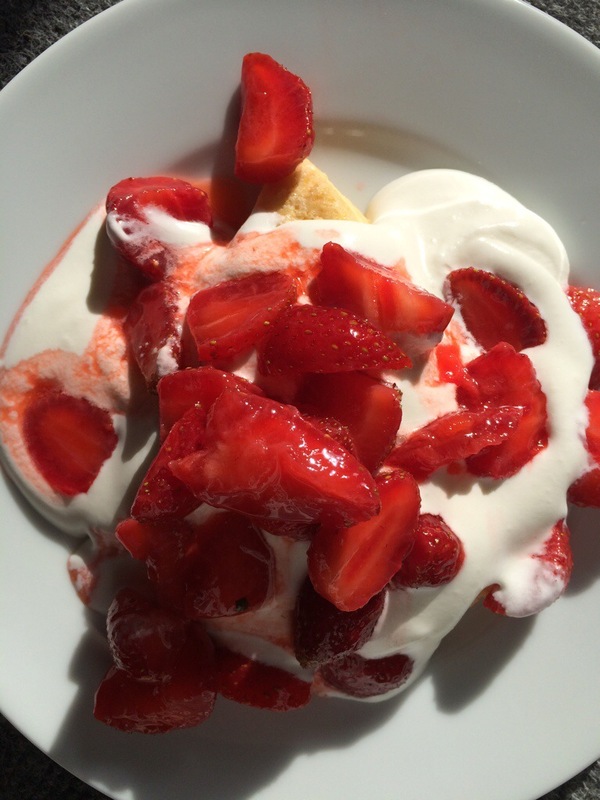 And for the leftover shortcake I am now eating for breakfast. 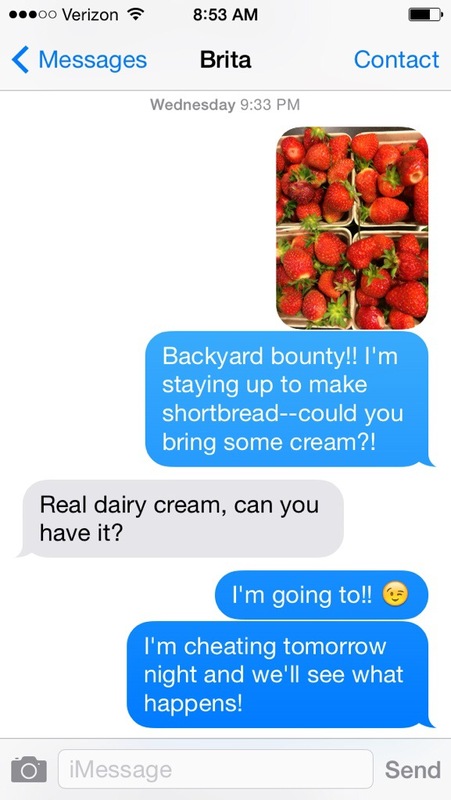 **When I’m looking to bake something, I usually turn to either Deb or Joy. This is a version of Deb’s, and it won’t disappoint! If you’re snazzy enough to own a food processor, combine the flour, sugar, baking powder, egg yolks, and salt. Either pulse or mix with a wooden spoon. Add the butter and pulse or get your hands dirty by rubbing the butter and flour between your fingers (this is my favorite part of baking and one reason I don’t use a food processor–I like the tactile-ness of the cold butter and soft flour) until the flour resembles coarse meal. Add 2/3 cup of cream and mix until the dough comes together. Using a sharp knife, cut the circle into 8 wedges and arrange on a parchment-lined baking sheet. Chill for 20 minutes (and up to 2 hours). There was much early debate at our counter whether the berries or whipped cream should go on first: in the end, we decided, it didn’t matter, and several of us did whipped cream, berries, whipped cream. You can’t really go wrong, right? I wish I had enough wherewithal to capture a picture of the four of us in shortcake heaven, but the only thing on my mind was getting more berries and cream into my mouth. Thus, I give you my breakfast. Not too shabby. ← Can I Get an ‘Amen’? A manual mower? Yikes! Isn’t any garden success just the best! And then, of course, you turn it into something that should be on the Food Network. Congratulations on the having a couple of nights of uninterrupted sleep! Emily waited for two years before she gave us one of those. Luckily she turned into the light of my life so I’ve forgiven her.